So the people that write the regulations for the “Great Big F1 Rule Book” have finally made a change for the good. Post race donuts are allowed! -Is performed safely and does not endanger other drivers or officials. -Does not call into question the legality of his car. -Does not delay the podium ceremony. 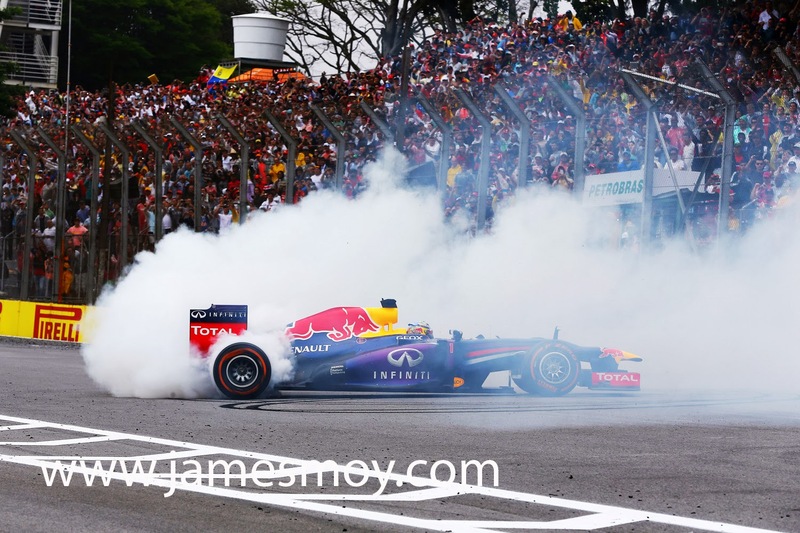 Sebastien Vettel performs donuts to celebrate his race win. Brazilian Grand Prix, 2014. So as long as it doesn’t interrupt the show, you can pretty much do anything! Great news..! Talking of “the show”, the Winter Olympics have held me, and most of the paddock, transfixed for the past few weeks. What an amazing array of disciplines, emotions and sportsmanship. I’ve learnt about new sports, learnt new words and been blown away by the different ways of slipping, sliding and falling over on ice. The Olympics have provided 3 weeks of addictive sporting viewing to an eager public that didn’t know the first thing about Super G, Slopestyle or Moguls. But it works. It entertains us, all of us! Isn’t that what sport is all about? It’s the entertainment that we crave at weekends after a gruelling week in the office? But what they have done now however will appeal to the fans, the tv audience, the broadcasters and the sponsors; it will make the show better. It is also great to see an improvement that hasn’t cost billions. In fact it has cost nothing. Zero...! And although I am applauding them, why stop there. Look at the examples and lessons we can learn from the Olympics. Why don’t we throw in some wild card events around F1? The F1 support race package at most grands prix has been the same for donkey’s years. Does racing get any more boring than Porsche Super Cup? Twenty rich, old blokes, driving around on a Sunday afternoon; it’s the motorsport equivalent of curling..! Should we not be showcasing new up and coming events that may attract the younger “dudes” to our sport just as the Winter Olympics has? Let’s take a leaf out of the Winter Olympics rule book. Why go feet first, when you can go head first.... why take off facing forwards when you can go backwards....why wear safety equipment at 100kph, when a bit of lycra will do, and remember, don’t walk down the stairs, ski down the hand rail. F1 can learn a lot.